Most of traffic accidents have happened due to drivers’ low awareness with 71.27 percent, said at a conference to review five year implementation of program to encourage people in keeping traffic order & safety for the period 2011-2016. The National Traffic Safety Committee and the Vietnam Fatherland Front (VFF) Central Committee jointly held the conference on November 23 in Hanoi with the participation of Chairman of VFF Central Committee Nguyen Thien Nhan and Deputy Prime Minister Truong Hoa Binh. At the conference, participants said that the most traffic violations are to drive in the wrong lane, over-speeding, unlawful overtaking, and drinking. Speaking at the conference, Chairman of VFF Central Committee Nguyen Thien Nhan said that traffic accident is a painful matter of the society. With efforts from all sectors, the number of annual traffic accidents has recently reduced yet it has still left horrible consequences. In five past years, the country reported over 158,000 traffic accidents killing 40,000 people. 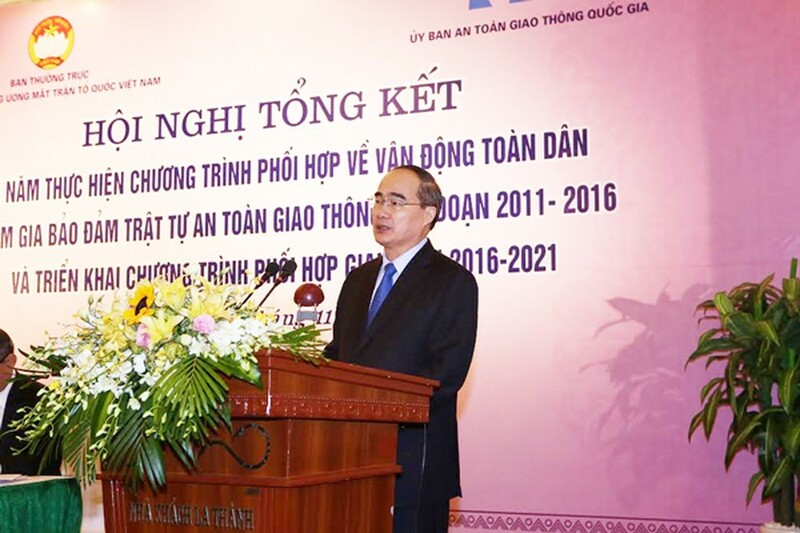 Worse, road traffic accidents account for 97 percent of total death toll; accordingly, all efforts should be focused on cut the number of road accidents, said Mr. Nhan, adding that the country should increase information of traffic law and raise people’s awareness of traffic regulation.